How to install movie box pro – Hello guys, today I have bad news and also I have good news for the iOS users. so the bad news is that the movie box is no longer on the iOS device. But don’t worry, because the good news is that now we have the movie box pro instead of movie box and the best thing is that you can download & install movie box pro on your iOS 12 and 12.1 devices. Guys, you don’t need the jailbreak or any root to install movie box pro on your device. Also, you can download it without paying a single penny. guys, in the market, has countless apps in the queue to compete with the movie box. But no one can better than the movie box and that’s why movie box developers instantly launched movie box pro after shutting down the movie box. Now I don’t want to become a lecturer anymore. so let’s go to the point and talk about the features of movie box pro then I’ll show you how to install movie box pro on your iOS 12 or 12.1 devices. You can watch videos without payment. Multi-language subtitle switching. Multi-audio switching. Now let’s see how to install movie box pro on your iOS 12 or earlier device. First of all, go to the Safari browser and type www.movieboxpro.app or you can click on the link below to redirect on the website. So when you are on the website. just scroll download and click on the (big yellow & black) button and tap iOS of course and tap download for free. Now, you have to complete just 1 step to download it on your device. The only step is that you should download the Test Flight app from the app store. Once you have downloaded Test Flight on your iOS device then go to the website and then click on the start testing button. This will install the movie box pro on your device. This is a beta app. so it’s still on beta and probably it might even make it to the app store we don’t know that yet. Hope, now you will have the movie box pro and now once you go to the home screen of your device then you will have the app right there. you notice an orange dot right there this indicates that the app is still on beta. Thank you guys for reading this article. 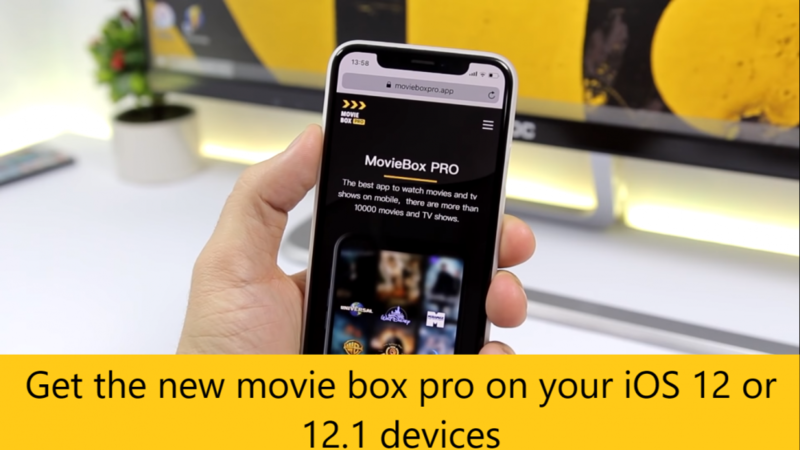 hope, you have found the method to download movie box pro on your iOS 12 or 12.1 devices. if you found this article is helpful for you then please share this with your friends, family members, and on the social media and also visit daily on this website. because we update here everyday new and helpful articles. now I’ll see you guys on the next one.